Optical Sorter Market size is set to exceed USD 3 billion by 2024, according to a new research report by Global Market Insights, Inc. The rising focus on automation to increase the productivity will provide an impetus to the optical sorter market. Automation in several industrial sectors has led to the development of centralized waste management solutions for the effective management of the waste, thereby driving the industry growth. They implement image-processing software and high-speed cameras to quickly scan and sort waste materials. There is a high demand for environmental resources with more countries becoming industrial economies and a rise in the population growth. The technology is extremely important for solid wastes as well as in the recycling industry as they help in segregating several materials. Moreover, the recycling plants can package and disperse a high amount of materials by implementing the technology in busy facilities, thereby driving the optical sorter market demand. Optical sorters are replacing manual sorting processes in the food industry owing to the rising labor costs, shortage in the labor force, and an increased demand from consumers who want high-quality systems. The rising labor costs are compelling several industries to implement these systems to perform critical and time-consuming tasks. The food industry is increasing its focus on implementing automation for increasing the productivity. From receiving raw products to inspecting the finished products, these systems are being implemented into the production lines to help in inspecting the production volumes. Moreover, these systems help in detecting and removing foreign material & defective products and help in achieving enhanced product quality and reduced operational costs, thereby driving the optical sorter market demand. Strict government regulations regarding food safety is a major factor driving the optical sorter market growth. The Food and Drug Administration (FDA) has set certain laws for ensuring the quality of food. These need to be very strictly observed to avoid inquiries from the FDA. Several businesses and companies are adopting innovative sorting machinery to meet the quality of their products. In addition, the Europe optical sorter market will witness a high growth of over 9% CAGR over the forecast time span owing to the rapid generation of e-waste. In the region, electronic & electrical waste is the highest growing waste. Recycling of these waste products has become crucial as it consists of several hazardous materials. For instance, recently in the UK, ANDRITZ MeWa, a plant builder in Germany, has built a WEEE plant that has implemented Sesotec optical sorters for waste management. The plant has been designed to process electronic & electric waste, recycled refrigerators, computers, and others. In the optical sorter market, hybrid sorters are witnessing a high demand from the food industry. These are powerful sorters that use a combination of proven air separation technology and food safety optimized flap separation that sort acceptable products. The companies are developing these platforms owing to the growing demand for high hygiene standards to be used in wet or dry food processes. China and Japan are experiencing a high adoption of these advanced sorting solutions owing to the faster technological adoption and rising industrial sector. Industries are deploying fully-automated sorting technologies for carrying out the business operations and processes. These factors are providing several growth opportunities to the optical sorter market growth. In MEA, the optical sorter market is gaining traction owing to the growing adoption of these systems in the mining industry. In the mining industry, these systems help in detecting & sensing the molecular composition of the materials & minerals such as gold, platinum, tanzanite, gemstones, and others. 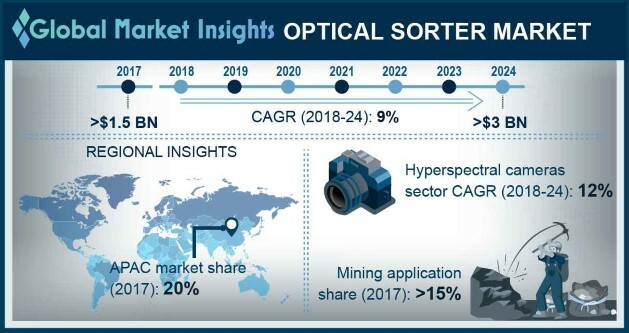 The systems allow the major mining companies to reduce mineral dilution, lower transport costs & strip ratios, optimize process flows, and remove containments, thereby driving the implementation of these systems and positively impacting the optical sorter market growth. Some key players in the optical sorter market include Tomra Systems ASA, Steinert GmbH, Sesotec GmbH, Satake Corporation, Raytec Vision SpA, Pellenc ST, Newtec A/S, National Recovery Technologies LLC, Key Technology, Inc., Greefa Italia GmbH, CP Manufacturing, Inc., Buhler AG, Binder + Co AG, Allgaier Werke GmbH, A/S Cimbria, and others. The players in the optical sorter market are developing new and advanced solutions for competing in the market. For instance, in May 2018, Steinert GmbH introduced Hyperspectral Imaging (HSI) camera technology in its NIR sorting unit, which is developed for the food industry. The machine helps detect differences between the chemical composition of a PET tray and PET bottle when sorting.